Super Hero Boy: Oh were off to see the wizard! Oh were off to see the wizard! One of my favorite childhood movies of all time recently got a brand new spanky new face lift and a brand new release! The Wizard of Oz as far as I'm concerned is a childhood classic. What little kid can get along without knowing the joy of following the yellow brick road, or the bizarre and sort of creepy wizard. Call me a weirdo but my favorite part of the entire movie is when the evil witch gets squashed by Dorothy's house. Something about those little curly feet with stripped socks sticking out from under the house still brings me to giggles at just the thought. I can't even tell you how many times I've seen the movie but I certainly could not count it out on my fingers and toes. Its really honestly hard to believe that this is the Wizard of Oz : 70th Anniversary 2 Disc Special Edition edition. Something about trying to imagine this movie being released 70 years ago just blows my mind. I'm sorry though I really love some of the great CGI effects we have today there is just nothing like the visuals on a good ole hand crafted movie with amazing set. I'm not sure you could make it any better today than they did 70 years ago. Honestly I don't think it would have the same charm without all the amazing sets they used for the film. Even the color and sound quality is remarkably good. What really blows my mind though is how amazing the picture looks in its new format. You'd think you'd see some flaws in the picture on the high definition screens we have today, but seriously its prettier and better than ever. Included in this release is the original movie as well as a whole second disc dedicated to special features. Including a really cool "making of" video that was fun to watch. Though this edition is far lighter in features than some of the more expensive versions being released at the same time you'll have plenty to keep you busy. Whats really great about this set is the price point. So many of the collectors sets are incredibly expensive. This one is very reasonably priced and is a great edition for a collector or just someone who really loves the movie like myself. 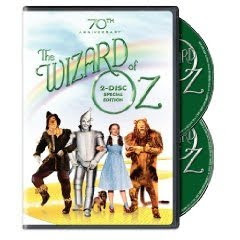 You can pick up your own copy of the Wizard of Oz : 70th Anniversary 2 Disc Collectors Edition right now on Amazon!